Manufacturers of merchandising units are focusing on the provision of variety solutions to their customers as a top-priority, along with benefits such as high appeal toward consumer interest, reduced prices, and facilitated logistics. Merchandising units manufacturers are also concentrating on retaining aesthetic appeal of their products while keeping efficiency intact. Corrugated cardboard units are being developed in order to offer retailers and brand owners with low-cost flexibility and versatile range of aesthetics. For example, “Pimp My Display” concept of STI Group enables retailers and brand owners dress up their universal stands in distinctive manners, for communicating local promotions and brand-specific concepts. 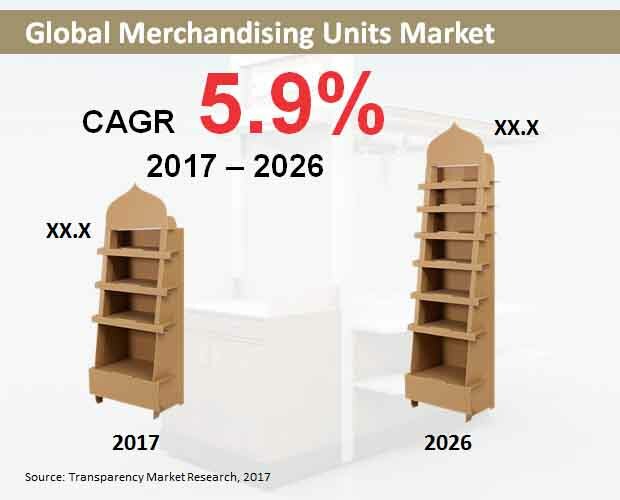 Key shareholders of the global merchandising units market, as identified by a new Transparency Market Research report, include STI Group, Cheshire Packaging, Tilsner Carton Company, Panda Inspire, Acryl Design Ltd, Print & Display, Expanda Stand, Boxes and Packaging, and Creative Displays Now. The report evaluates the global market for merchandising units to ride on a stable CAGR during the forecast period, 2017 to 2026. Worldwide sales of merchandising units are poised to surpass US$ 600 Mn in revenues by 2026-end. Easy-to-use merchandising units have gained immense popularity among retailers worldwide, often delivered to stores that are prefilled with products, thereby enabling stands to be set up in simple steps. Additional features provided such as integrated casters and wheeled pallets have further facilitated placing of merchandising units in these stores, thereby driving their adoption. Demand for merchandising units is further being propelled by their provision of easy tailoring of mix & quantity of prefilled products on these units, staying abreast with requirements of individual retail stores or sales channels. Over the years, merchandising units have emerged as essential combination of displays and packaging solutions, with design focus directed toward optimization of handling, distribution, and merchandising enormous product quantities in retail stores. Manufacturers generally concentrate on designing modular merchandising units, utilizing corrugated boxes to keep their environmental footprint in check. Optimization of logistic operations is the main objective of these designs, implying extensions of shelf-ready packaging. In terms of revenues, Europe will continue to spearhead the global market for merchandising units, closely trailed by North America and Asia-Pacific excluding Japan (APEJ). However, revenues from merchandising units’ sales in APEJ are set to record a relatively faster increase through 2026. Sales in Middle-East & Africa are also expected to exhibit an impressive expansion, albeit revenues from this region’s market will remain sluggish in the period of forecast. Hypermarkets and supermarkets will continue to be the most remunerative end-users of merchandising units. Specialists & experienced suppliers of merchandising units are continually developing products that meet demands of high traffic locations such as hypermarkets and supermarkets. Manufacturers are offering merchandising units specially designed for these end-users, which provide highly effective mobile sales solutions for clients seeking creation of simple, cost-effective, highly-visible, and versatile retail ready displays. Demand for requirement-specific merchandising units has emerged as a popular trend in the retail sector. Manufacturers are providing customized solutions to suit specifications of retailers’ needs. Customized merchandising units are therefore expected to remain dominant in the market, in terms of revenues. Demand for standard merchandising units will continue to be sluggish in the market.